LEARN. 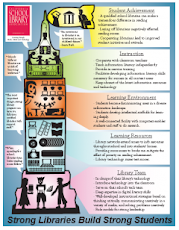 Read about what a strong school library is, how students benefit, and how the Model School Library Standards are blueprints for building or rebuilding strong school libraries. DO. Plan and implement the Standards at your school and urge others to do the same. Insist that WASC and other accrediting agencies use the Model School Library Standards when evaluating schools. DONATE. Give your time, talent, and dollars. Join us in making a difference.